BUFFALO, N.Y. — Like a yoga novice, electronic components don't stretch easily. But that's changing thanks to a variation of origami that involves cutting folded pieces of paper. 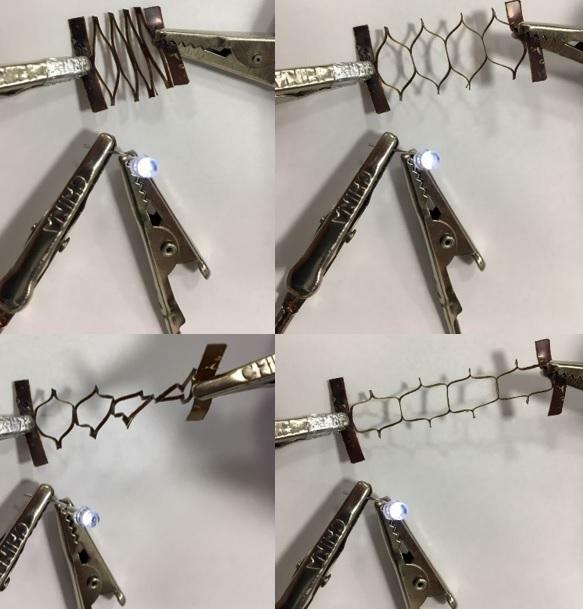 In a study published April 2 in the journal Advanced Materials, a University at Buffalo-led research team describes how kirigami has inspired its efforts to build malleable electronic circuits. Their innovation — creating tiny sheets of strong yet bendable electronic materials made of select polymers and nanowires — could lead to improvements in smart clothing, electronic skin and other applications that require pliable circuitry. "Traditional electronics, like the printed circuit boards in tablets and other electronic devices, are rigid. That's not a good match for the human body, which is full of bends and curves, especially when we are moving, says lead author Shenqiang Ren, professor in the Department of Mechanical and Aerospace Engineering. "We examined the design principles behind kirigami, which is an efficient and beautiful art form, and applied them to our work to develop a much stronger and stretchable conductor of power," says Ren, also a member of UB's RENEW Institute, which is dedicated to solving complex environmental problems. The study, which includes computational modeling contributions from Temple University researchers, employs nanoconfinement engineering and strain engineering (a strategy in semiconductor manufacturing used to boost device performance). Without kirigami, the polymer – known as PthTFB — can be deformed up to 6 percent from its original shape without changing its electronic conductivity. With kirigami, the polymer can stretch up to 2,000 percent. Also, the conductivity of PthTFB with kirigami increases by three orders of magnitude. The advancement has many potential applications, including electronic skin (thin electronic material that mimics human skin, often used in robotic and health applications), bendable display screens and electronic paper. But its most useful application could be in smart clothing, a market that analysts says could reach $4 billion by 2024. The research was supported the U.S. Department of Energy.